On a long and lonely walk home from who-knows-where, it's dark. It's quiet. But it's an eerie kind of quiet, where every rustled leaf and snapped twig grabs your attention. The night breeze shakes every tree along your path, branches creaking with unfamiliar noises as you realize you're not even halfway home. You gotta hurry. You pick up the pace as noises grow louder, with the sinking feeling that every one of your anxious footsteps is being watched. The forest is whirring, your thoughts are stirring and you're just trying to not worry about what's behind you. This would normally be the perfect time for the UFO to rise over the trees, right? Flashing galactic lights and gusting winds approach, as the famous central abduction beam opens. At least, that's how space men used to seize earthlings. It seems this Halloween an otherworldly creature has grabbed you like an angry bouncer. Either it's an aggressive, interplanetary welcome or you're on your way to the mothership for probing. 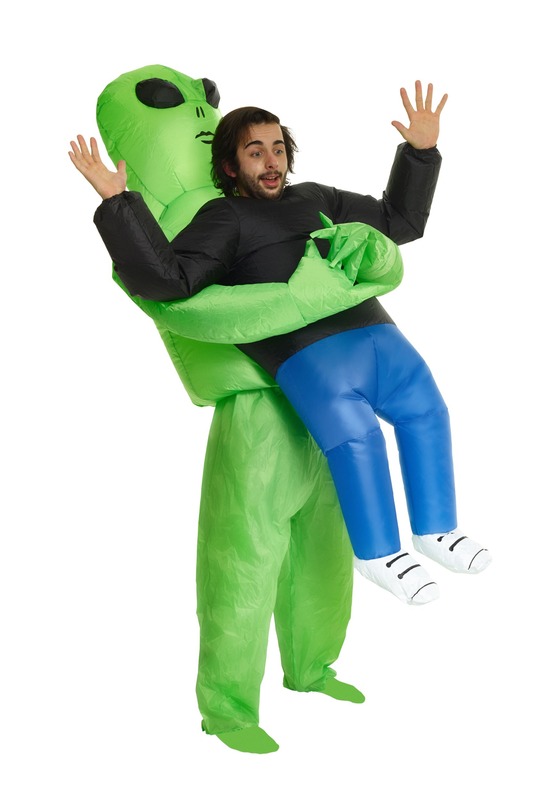 Whichever sci-fi tale you’d like to spin, this Pick Me Up inflatable alien costume is an hilarious go-to for any situation. Be ready to ask for a plus-one invitation for your goofy, green friend. Or call for help if he's running off into the woods again.